Elk Flats is the uppermost trailhead (from the south side of the river) that comes down to the mainstem Wenaha, or at least close to the mainstem Wenaha. 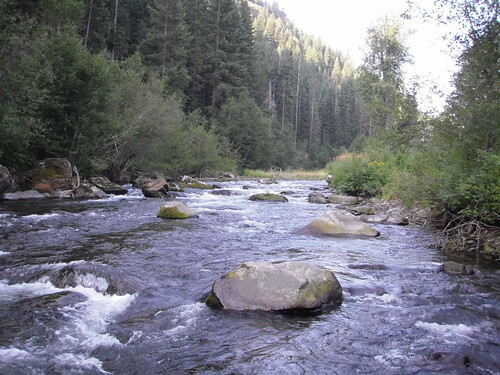 The trail actually comes down to the South Fork of the Wenaha and the Wenaha Forks are a half mile or so down stream. For me it is the trail I have been down the least. I didn’t even make a trip down it last year. I had intended to, but the summer slipped by and steelhead started drawing my attention elsewhere. I should not have skipped it. This last trip down Elk Flats ranks right up there with some of my best days fishing and hiking on the Wenaha ever. 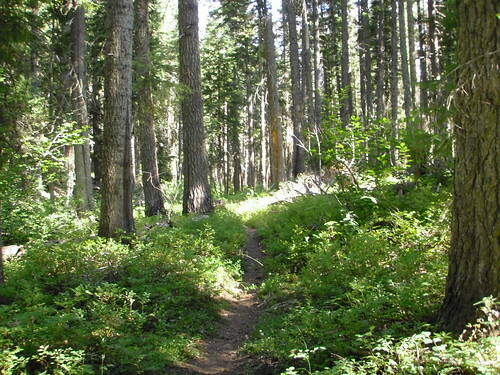 Elk Flats is about a five mile hike with a roughly 2,100 ft elevation change. One nice thing about it versus Hoodoo or Cross Canyon is that it is almost entirely in the shade. In the spring and fall this does not matter so much, but with summer temperatures in the 80’s and 90’s, the shade is a real asset. Hiking out of Hoodoo requires an early or late start to get shade, while Cross Canyon is only shaded in the morning. These other two trails do offer great views on the hike in and out, but the cost is no midday shade. Elk Flats on the other hand has very few scenic views, but has enough shade that you can hike out anytime of day. I hiked in at the end of the day Friday, arriving at the river around 7:00 in the evening. This still gave me plenty of time to set up camp and get some dinner cooked. As I arrived at the campsite I could see a deer behind a down tree licking part of a mineral block. She apparently did not see me approach and when she did realize I was there, she took off at a dead run. The next morning when I woke I thought about that deer and quietly unzipped the window of my tent. I could not see the deer, but when I got out of my tent I spotted her again and made a quick duck back down. I grabbed my video camera and got some good footage as she leisurely made her way back into the forest. I set out from camp after some coffee and instant oatmeal (my favorite camping breakfast when I have to pack it on my back). Rather than get on the trail and hike down stream to the forks, I waded my way downstream. I always seem to enjoy the water more, even if it is just wading down to where I am going to start fishing. Summer is the best and worst of times for me. It is the best because I can get out and fish and camp most any water I please. It is the worst because it is the busiest time of year for my business and I have almost zero free time during the week if I want to get all my work done before the weekend arrives. What this means is that rather than tying flies in the evening to fill missing spots in my boxes I have to spend my evenings doing paperwork. So I often look into my flybox at the beginning of a weekend and feel a little disappointed with the sparse selection, while just a month or two earlier, and my fly boxes looked full to the brim. This particular weekend I realized that I was down to one woolly bugger and that one didn’t last long. The first mile of river below the forks is almost all pocket water. There are no pools and only two run-like sections. There are, however, lots of boulders creating excellent pocket water. 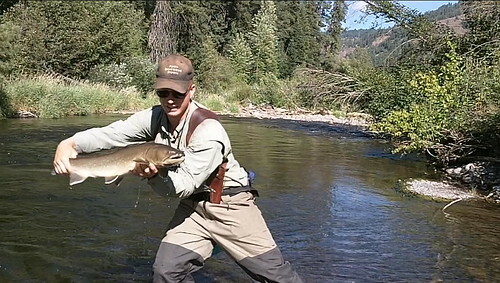 This combined with some wider, slack water near the banks in spots made for great fishing on the Wenaha River. As I was getting ready to fish one section of pocket water I loosened my flies from my rod and gave them a short roll cast down stream to let out some line and a 23” bull nailed them. Not knowing the fish had taken my flies, I tried to roll cast upstream only to find that there was a very large fish on the other end. Those are the good things to accidentally get your flies hooked on. In this first mile of water I also saw a moose with a calf. They were right in the middle of the river. When I first saw a large dark object in the middle of the river, my first thought was bear. But as it turned, I could see clearly that it had a moose head. After watching for a moment, I clumsily pulled my video camera out and captured a distant moving object on the screen. Perhaps next time. After a mile of the pocket water, the river began its usual clockwork of runs, pools, and riffles. The rest of the day was quite good as well. I ended the day about 4 miles down stream and began the hike back to camp. Sunday I was feeling rather content after the great day of fishing I had experienced on Saturday. Since I had a 5 mile hike out with 2,100 feet elevation to gain, I didn’t really feel like adding much mileage to it. Instead, I made some extra coffee and simply enjoyed the morning in the woods with the river rushing by. After a while I decided to do some exploring close to camp and took my small saw that I had packed in with me. I found a game trail that headed away from the river and back towards the hillside. The game trail was a bit tight so I widened and heightened it out a bit with my saw. I crossed a small creek and eventually got the trail opened up to a big open area near the hillside. I then found another game trail that leads towards the river. I ended up spending several hours brushing out a game trail that made an alternate route to the river. I rather enjoyed it actually. Yes, it was hard work and from the looks of my arms, someone would probably think I was fighting cats all morning. I forgot to mention that on my hike in I tried out my new saw as well. There was a nice sized log across the trail and I took to it with my saw. The log was about waste high and was definitely in the way. The log was probably only 16” wide, but it was big enough that it was a bit of work to saw through it. After sawing through it on one side of the trail, the left side rolled and fell to the ground, making it much easier to pass. I was planning on making two cuts so as to remove the section that was over the trail, but by the time I got done with one side, the mosquitoes were on to me and had already sucked a fair amount of my blood. So I left the other side for someone else. I did not begin my hike out until about 3:30 in the afternoon. It always seems to take longer to pack up my stuff than I think it will. The hike out was no less good than the rest of the weekend. About half ways up the trail, a bear started running up the hillside about 50 feet away from me. Apparently he did not here me coming around the bend of the trail. Once again I fumbled for my camera and was able to get some distant footage. Another mile or so up the trail and I heard something crashing around through the brush in the draw below me. I stopped and listened. Again I heard it, but there was something below me and to my right and something higher up to my left. I quietly eased my pack off and turned on my camera. I quietly began to make my way down the hillside into the draw. I kept stopping and listening. The noise was not very far away, but the trees were so thick that I could not see any distance. I began to wonder if there was a sow bear and cub separated and I didn’t particularly like the idea of getting in between them. Right after thinking about that I heard the sow making that heavy breathing or huffing sound that they signal cubs with to climb a tree. She was right below me just on the other side of a few small dead trees that partially blocked my view. I eased my way to the left and I could see two cubs and the sow. One of the cubs scrambled up a tree and was looking right at me. The sow kept sniffing the air and did not seem to see me, although I could see her. She moved to the right, behind more trees. I could again here another bear somewhere to the left of me, though I could not see where it was. I stayed put for a few minutes, videoing the cub go up and down the tree. I was getting pretty nervous with how close I was to them so I backed up the hill to the trail and shot a little more video of the cub going up another tree. Again the sow was just below me in some brush. I could have thrown a rock and hit the sow she was so close. I decided it was time to get out of there and I quietly put on my pack and headed back up the trail. And that was the end of a great weekend trip. This entry was posted in Wenaha and tagged elk flats. Bookmark the permalink.